In summer 2016 West Point cadets flew a toy quadcopter around what could only generously be described as urban terrain: a handful of wood-and-cinder block structures regularly held and taken by cadets learning the ins-and-outs of raids. What made that mission stand out was the seamless integration of new, commercial technology: a toy drone defenders could use to coordinate supporting artillery, and a scratch-built antenna and computer in an airsoft rifle body the attackers could use to take out the drone. 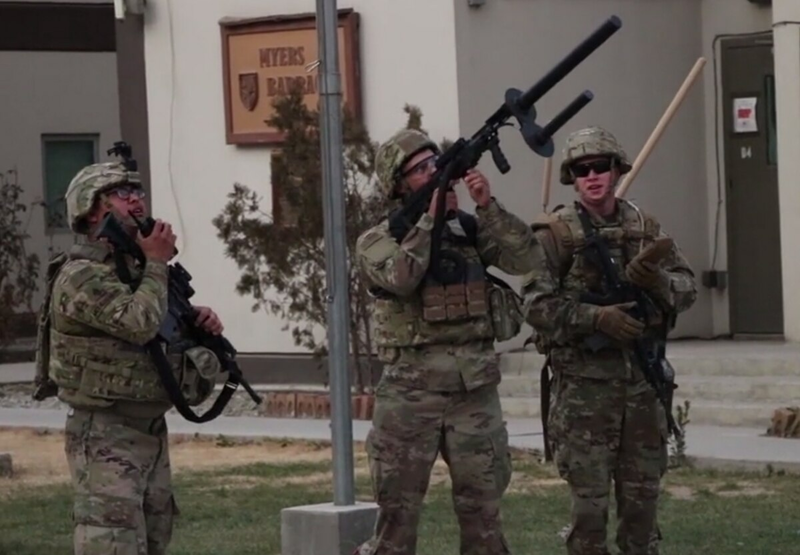 Less than two years later, we’ve seen the Pentagon go from teaching hypothetical scenarios to training National Guardsmen deployed in Kabul how to use contractor-built anti-drone rifles against mock drone attacks. As seen in a February 2018 video embedded below, members of the Oklahoma Army National Guard are training with perhaps the prototypical equipment of the present moment in drone and counter-drone warfare. The target drone is a crisp white quadcopter, similar in appearance to the wildly popular DJI Phantom series, though the model is never specified. Arrayed against it is what appears to be the twin-antennas of the Battelle DroneDefender, a drone-jamming weapon that resembles nothing so much as a science fiction rendering of a future shotgun, versions of which have been deployed to Iraq. In addition, the unit trained with a tool to detect the drone by the signals it sends through the electromagnetic spectrum. The actual scenario appears less elaborate than the West Point cyber-rifle experience. This is fair; the cyber-rifle was one component of a broader established training for students at the military academy, and this was a narrower lesson about specifically figuring out how to use the counter-drone gear on hand. As the United States-led war in Afghanistan approaches its 17th year, it is remarkable to see technology go from hypothetical threat to training tool to observed threat to threat with countermeasures on hand, all in the space of a couple years.